Spring rolls are my go to whenever I am ordering Chinese food. I love those crispy little morsels! But whenever I thought about making them at home I didn’t have a deep fryer nor did I want to waste a ton of oil in a makeshift deep fryer. Luckily I did some research and learned that baked spring rolls are indeed a possibility. And holy heck they might just be the tastiest thing I’ve made since starting this blog (or at least top 10!). I tried this recipe for the first time this past weekend for a gals trip up North. Let’s just say it was certainly not my last time making them! Find the super easy and flavorful recipe below. 1) Use spring rolls wraps instead of egg roll, much thinner and better! Incorporate these tweaks into the notes below and you’ll be whipping up an AWESOME batch. I made two options, one that is vegetarian-friendly and one that has meat. And I liked them both! So whatever you prefer, I recommend either. 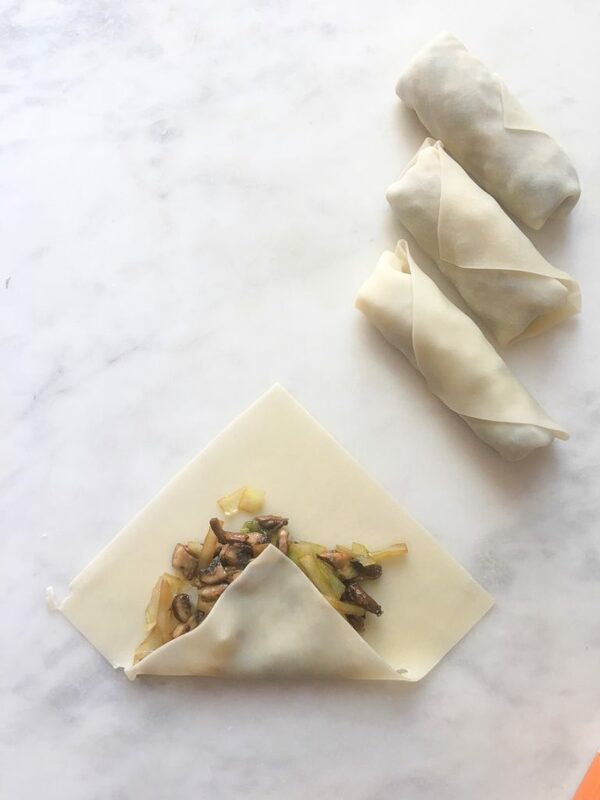 To make veggie spring rolls, use the same ingredients as above, just eliminate the meat and double the cabbage and mushrooms. Preheat the oven to 400F. For the chicken spring rolls, cook the ground chicken, cabbage, mushrooms, green onion, ginger and garlic in sesame oil. For the veggie spring rolls do the same except without the meat. When ingredients are cooked, mix in the Hoisin sauce, then set aside to cool before rolling up. 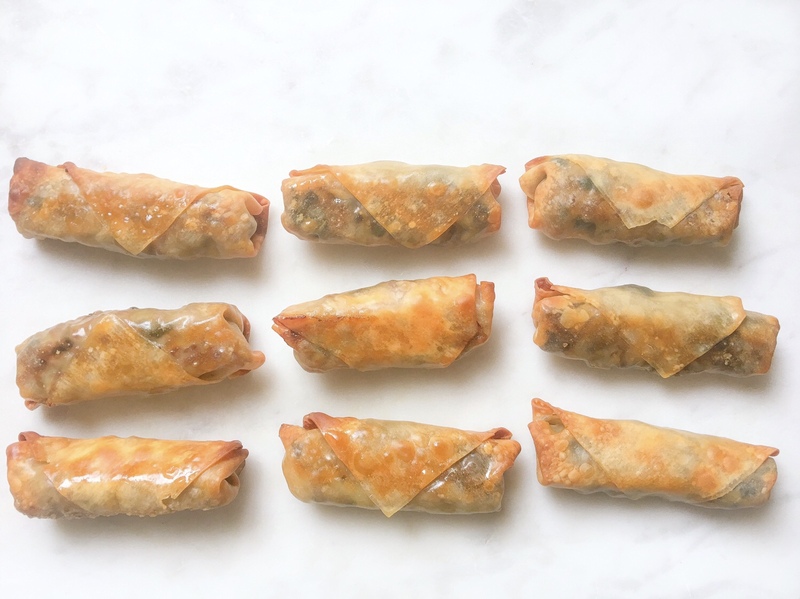 To assemble, lay out a spring roll wrapper so it looks like a diamond facing you, scoop in 1-2 tablespoons of ingredients. Fold in one corner, tuck in the left and right side and roll it up like a burrito. Dip your finger in water and gently press against the edge to seal it. 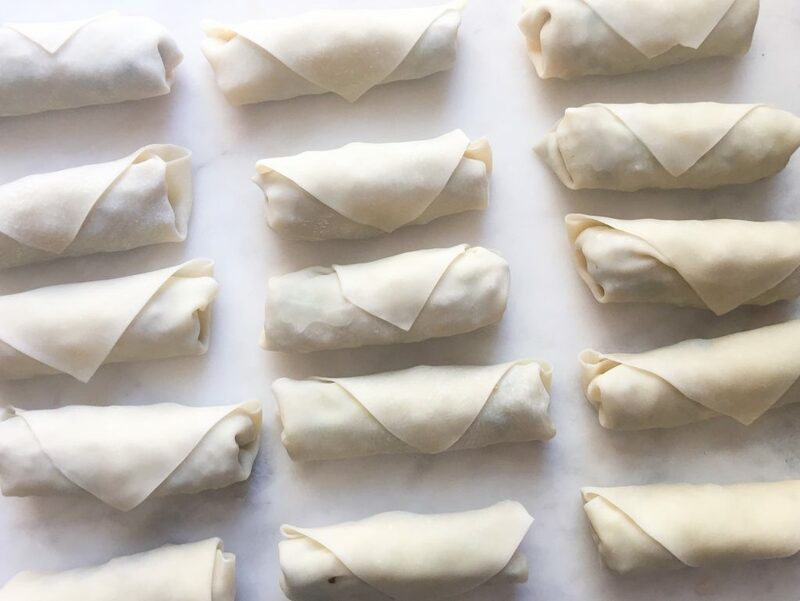 When all of your egg rolls are wrapped up, brush them with egg whites or olive oil, flip over and brush the other side. Toss them in the oven for about 20 minutes (or longer if you like them extra crispy!). Serve with sweet chili sauce!